We love Willows Activity Farm (just off the M25 near St Albans) at any time of year, but at Christmastime, it really is something special. A jam-packed programme means you can spend the whole day soaking up the Christmas spirit, and even if it’s freezing outside, there are loads of indoor activities to warm your cockles and your toes. When we arrived the children ran in, so excited to be there, and immediately started spotting the reindeer which the eldest wrote down in their elf passports – a little booklet to guide them around Willows Farm and make sure we all got the most from our experience. After a quick bite to eat (we usually take sandwiches and eat in one of the picnic areas, but there are two lovely cafes where you can get lunch) the children wanted to go on the Christmas funfair rides which are all included in the ticket price (as is everything else, except food and drink). We then went to ride on Travis the Tractor, who is decorated for Christmas and took us on a festive wood ride as we jingled our bells to the Christmas tunes. After a play in the incredible Peter Rabbit Adventure Playground, we were ready to warm up indoors, so went to the 3D cinema to watch the Christmas film adventure. The action came so close that our two year old thought she could touch it! Nearby you can meet the Willows Farm reindeer and there’s also the chance to meet Mischka the husky. Then it was off to the ‘create a cuddle’ workshop, where our children were given a soft cuddly reindeer, some stuffing, and they chose a colourful heart to put inside their toy. After we made them, and gave them a hug, we wrote letters to Father Christmas with the elves, and posted them in a letter box. Exciting! Lots of people will head straight to Santa’s Grotto, for the big event, but I’m a big fan of anticipation, and not such a big fan of queues, so we built ourselves up slowly by taking in some of the usual attractions as well as the special Christmas events, and by 3pm the light was fading and we headed into see the big man. Exciting! 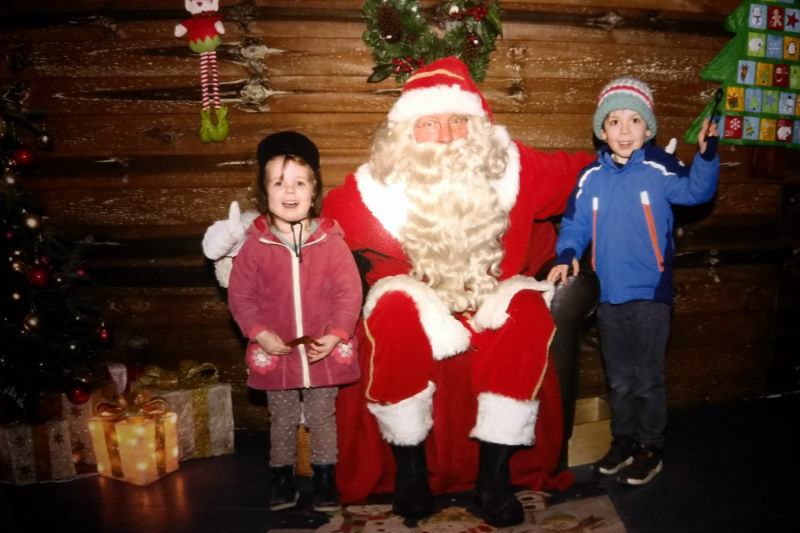 As we passed the indoor ice rink and wove our way through beautiful Christmas displays featuring Father Christmas’ house and workshop, some lovely giant nutcracker soldiers and an Arctic wonderland, we were greeted by Santa’s helpers who were ready to chat to our children and stamp their little passports. We were led through to the grotto and knocked on the door before heading into a cosy den, stacked with presents, a tree, twinkling lights and a red-suited chap with a luscious beard. We had plenty of time to chat to Santa, and he spoke to the children about what they’d been up to, and of course what they’d like for Christmas. For the record, the eldest wants surprises, the youngest would like presents. It’s a wide brief for the present buyer, but I’ll take that. As we had family photos with the big man, he gave each of my little folks a large, glittering key to his toy shop so they could choose a gift from him to take home. I remember the tat which I was given by FC in the old days popping to the local department store, but the gifts in Santa’s toy shop at Willows Farm are actually things that you would want to buy. My daughter chose a Thomas the Tank Engine stationmasters case, while my son picked some gorgeous Little Red Riding Hood finger puppets. Of course there was a good deal of procrastination and several toys were selected before we made our final choice. Heading out, we opted to pay £12 for the photo of Santa and the kids as a memento of our day, before having one last play in the Cottontail Village indoor play street, and heading home, exhausted but happy after a truly magical, spectacular day. So, how much does it cost? Well, if we had rocked up on the day it would have cost £112 for the four of us, or £104 if we had booked in advance, which is a lot of money. It costs significantly less if you have a child or children under the age of two. But it’s so much more than just visiting Santa – it’s a festive theatre show, an ice-skating trip, a 3D Christmas movie, a nativity play with live animals, and hours and hours of play and everything is included in your ticket price. Plus each child leaves with a snuggly soft toy and a great quality gift from Santa and everyone – adults included – leaves with a smile on their face, and a shedload of happy memories. And you can’t put a price on that. Disclaimer: Willows Activity Farm very kindly gave us free tickets for this trip, but as ever, we review any experience on The Motherload® as truthfully as possible in keeping with our ethos.